Influenza viruses represent a threat to the world population. The currently available standard of care influenza vaccines are offered for each influenza season to prevent infection and spread of influenza viruses. Current vaccine formulations rely on using wild-type Ags, including the hemagglutinin (HA) and neuraminidase (NA) proteins as the primary immune targets of the vaccine. However, vaccine effectiveness varies from season to season, ranging from 10 to 75% depending on season and on age group studied. To improve rates of vaccine effectiveness, a new generation of computationally optimized broadly reactive Ags (COBRA)-based vaccines have been developed as a next-generation influenza vaccine. In this report, mice were intranasally, i.p., or i.m. primed with reassortant influenza viruses expressing different H1N1 COBRA HA proteins. These mice were subsequently boosted i.p. or i.m. with the same viruses. Sera collected from mice that were intranasally infected and i.p. boosted with COBRA-based viruses had broad anti-HA IgG binding, hemagglutination inhibition, and neutralizing activity against a panel of seasonal and pandemic H1N1 viruses. Mice immunized with viruses expressing a seasonal or pandemic H1N1 HA protein had antisera that recognized fewer viruses in the panel. Overall, COBRA-based HA proteins displayed on the surface of a virus elicited a breadth of Abs that recognized and neutralized historical H1N1 strains as well as more contemporary H1N1 viruses. Seasonal influenza viruses are responsible for ∼500,000 annual worldwide deaths and ∼5 million hospitalizations worldwide each year (1). Infants, immunocompromised individuals, and the elderly are particularly susceptible, with 90% of deaths occurring in aged populations (2). Influenza viruses can also cause pandemics that are associated with higher levels of morbidity and mortality (3). Preventive vaccination is the most effective way to prevent influenza virus–induced disease and pneumonia. Trivalent or quadrivalent vaccines usually elicit a potent neutralizing immune response against specific influenza strains. However, influenza viruses undergo antigenic drift that often results in antigenic mismatches between the vaccine and the circulating strains (4). As an example, the vaccine coverage for the 2017–2018 influenza season, estimated to be ∼39% in the United States, has been lower compared with that achieved in the previous seasons (5). Moreover, as a result of an antigenic shift, a pandemic could occur with a new subtype or an antigenic variant of an existing subtype beginning to circulate in the human population (6). Therefore, the development of influenza vaccines that elicit a broader protective immune response and are able to neutralize all circulating viruses is critical (7). Previously, our research group described a strategy to elicit broadly reactive Abs to protect against the diverse influenza viruses within a subtype termed computationally optimized broadly reactive Ags (COBRA) (8). The COBRA methodology was used to generate new hemagglutinin (HA)-based glycoproteins as vaccine immunogens. Using a layered consensus approach with multiple rounds of layered consensus generation, these unique HA proteins take into consideration not only the phylogenetic sequence of each isolate but also the time frame and outbreak in which each isolate was collected. By using this strategy, COBRA HA vaccine candidates elicit a broader and cross-protective immune response against multiple influenza viruses within a subtype compared with that elicited by single strain–based vaccine (8–16). COBRA HA Ags were expressed on the surface of a virus-like particle (VLP) vaccine able to elicit a protective Ab response against divergent viruses within the H5N1, H1N1, and H3N2 subtypes (9, 11–13). Currently, the inactivated split (IIV), recombinant HA (rHA) protein, and live attenuated influenza virus (LAIV) vaccines are licensed for human vaccination. IIV is administered by the i.m./intradermal routes and is licensed for use in all age groups. However, effectiveness rates vary from season to season (17, 18). LAIV is administered intranasally (i.n.) and replicates only in the air-cooled environment of the upper respiratory tract and results in a mild and self-limiting infection. LAIV elicits cellular and mucosal Ab responses (19, 20). LAIV has greater effectiveness in children than IIV (21–23). In this study, COBRA HA Ags were delivered to the nasal mucosa of mice by live virus infections. These initial immune responses were boosted following i.p. vaccination with the same virus. This regimen elicited high-titer, cross-protective Abs against a large number of H1N1 influenza viral isolates, representative of historical and current vaccine strains, compared with mice immunized with vaccines expressing wild-type HA Ags. Candidate COBRA HA Ags for H1N1 were as follows: P1, X3, and X6 have been previously described (9). Briefly, H1 HA sequences were downloaded from the Global Initiative on Sharing All Influenza Data online database. X3 HA COBRA was designed using sequences from viruses isolated over a recent 30-y period (1978–2008), and X6 HA COBRA was based upon sequences representing the last 10 y (1999–2012). The P1 HA Ag was designed using sequences from H1N1 viruses isolated from humans between 1933 and 1957 and 2009 to 2011 and swine sequences isolated from 1931 to 1998. BALB/c mice (female, 8–10 wk of age) Ab negative for circulating influenza A (H1N1 and H3N2) and influenza B viruses were purchased from The Jackson Laboratory (Bar Harbor, ME) and housed in microisolator units and fed ad libitum. Mice were handled in accordance with protocols approved by Institutional Animal Care and Use Committees (IACUC) and were cared for under U.S. Department of Agriculture guidelines for laboratory animals. As stated by the IACUC protocols, mice were humanely euthanized in the case of a weight loss ≥20% of the original weight. Different groups of mice (five mice per group) were i.n., i.m., or i.p. primed with a solution of the COBRA P1 virus corresponding to 105 PFU for the i.n. administration or 1.5 μg of HA protein–containing virus adjuvanted with IFA or alum hydroxide for a final volume of 50 and 200 μl/mouse for the i.m. or i.p. administration, respectively, as approved by the IACUC. Mice were monitored daily for weight loss, disease signs, and death for up to 14 d. The mock-infected groups were primed analogously with PBS. Twenty-one days postprime, all the different mouse groups were i.m. (i.n. + i.m. or i.m. + i.m.) or i.p. (i.n. + i.p. or i.p. + i.p.) boosted with the homologous virus adjuvanted with IFA or alum hydroxide, as already described above (Fig. 1). Blood was collected at day 0, 21, 35, 46, and 59 postprime, and serum was harvested and frozen at −20 ± 5°C until use. To achieve a sufficient amount of serum to perform all the subsequent experimental assays, sera from day 35, 46, and 59 belonging to the same mouse were pooled. Sera from all these time points had statistically similar anti-HA IgG Ab titers, using the homologous Ag. In a separate study, mice were i.n. infected (50 μl containing 105 PFU) with one of the three COBRA viruses (P1, X3, or X6, n = 15 per COBRA virus) or one of the four seasonal influenza viruses (5 × 105 PFU) (A/Chile/1/1983 [Chile/83, n = 10], A/Singapore/6/1986 [Sing/86, n = 5], A/New Caledonia/20/1999 [NC/99, n = 10], or A/Brisbane/59/2007 [Brisb/07, n = 10]) or the pandemic A/California/07/2009 (CA/09, n = 15) H1N1 influenza virus (103 PFU) and monitored daily for weight loss, disease signs, and mortality for up to 14 d. Given the high morbidity rate of the pandemic strain virus, 9/15 mice of the CA/09-infected mice were humanely euthanized because of a weight loss ≥20%. A control group (n = 5) was mock infected using 50 μl of PBS. Twenty-one days postprime, mice were i.p. vaccinated with the homologous virus adjuvanted with alum hydroxide (Fig. 1). Blood was collected at day 0, 21, 35, 46, and 59 postprime, and serum was harvested and frozen at −20 ± 5°C until use. To assess viral replication, mice (n = 3) were infected (50 μl containing 105 PFU) with COBRA viruses (P1, X3, or X6) or representative wild-type viruses causing no/low (Chile/83), mild (Brisb/07), or a considerable weight loss (CA/09). Mice were sacrificed at day 2 and day 3 postinfection and lungs harvested. Collected lungs were weighted and then homogenized in DMEM (DMEM; Corning, NY) supplemented with penicillin-streptomycin for a final concentration of 100 mg of lung tissue per milliliter. Samples were frozen at −80°C until use. All the 7:1 recombinant PR/8 reassortant COBRA and Chile/83, NC/99, Brisb/07, or viruses and wild-type Sing/86, CA/09, and A/Michigan/45/2015 viruses were propagated in embryonated chicken eggs as previously described (24). HA-specific content in the different virus preparations was determined by densitometry of reducing SDS-PAGE, with the HA band identified by Western blotting similarly to previously described protocols (9). In brief, virus preparations or other HA-containing samples or standards were electrophoresed on a 10% Bis-Tris SDS-PAGE (Thermo Fisher Scientific, Waltham, MA) and transferred to a PVDF membrane through a Trans-Blot Turbo Transfer System (Bio-Rad, Hercules, CA), following the instruction provided by the manufacturer. The blot was probed with a clade 1–specific mouse mAb (clone 15B7; Immune Technology, New York, NY), and the HA–Ab complexes were detected through an HRP-conjugated anti-mouse IgG (Southern Biotech, Birmingham, AL) as a secondary Ab using an iBind Western Device (Thermo Fisher Scientific). Molecular weights were calculated for all bands relative to the Spectra Multicolor Broad Range Protein Ladder (Thermo Fisher Scientific), and images were acquired and analyzed through a myECL Imager device (Thermo Fisher Scientific). The densities of HA bands from the corresponding rHA standards (expressed and purified as described below) were used to generate standard curves. The amounts of HA in the virus lanes were calculated by interpolation from the data of the standard curve. MDCK (Madin–Darby canine kidney) and MDCK-SIAT1 cells were maintained in DMEM supplemented with penicillin-streptomycin, BSA fraction V 7.5% solution, 25 mM HEPES buffer, and 10% heat-inactivated FBS (FBS; Atlanta Biologicals, Flowery Branch, GA). All supplements except FBS were purchased from Thermo Fisher Scientific. For virus tittering, a plaque assay was performed similarly to previously described protocols (9). In brief, low-passage MDCK cells were plated at a confluency of 3.8 × 105 in each well of a six-well plate (Greiner Bio-One, Monroe, NC) 2 d before the assay. Samples were diluted and overlaid onto the cells in 100 μl of DMEM supplemented with penicillin-streptomycin and incubated for 1 h. Samples were removed, cells were washed, and medium was replaced with 2 ml of Modified Eagle Medium plus 0.8% agarose (Cambrex, East Rutherford, NJ) and incubated for 72 h at 37°C with 5% CO2. Agarose was removed and discarded. The cells were then fixed with 10% buffered formalin and then stained with 1% Crystal Violet (Fisher Science Education) for 15 min. Following thorough washing in distilled water to remove excess Crystal Violet, the plates were dried, the numbers of plaques counted, and the PFU per milliliter or per gram of lung tissue was calculated. To measure the plaque area, the open source ImageJ (https://imagej.nih.gov/ij/) software was used. The full HA open reading frame encoding for the COBRA (P1, X3, and X6) and H1N1 HA Ags derived from the wild-type viruses Chile/83, Sing/86, NC/99, Brisb/07, and CA/09 was cloned into the pTR600 vector (25). A chimeric HA protein (named cH6/1) composed of the globular head region from H6N1 isolate A/mallard/Sweden/81/2002 and the HA stem region of pH1N1 isolate CA/09 and similar to the previously described chimeric HA protein by He et al. (26) was synthesized by Genewiz (South Plainfield, NJ). In detail, the encoding genes consisting in the extracellular domain of HA possessing the Y98F mutation to attenuate sialic acid binding (HA∆SA) C-terminally fused to the trimeric FoldOn domain of T4 fibritin, an AviTag sequence, and a hexahistidine affinity tag (27, 28) were cloned into the mammalian expression vector pcDNA3.1/Zeo(+) (Thermo Fisher Scientific). Truncated rHA encoding HA from Chile/83, Sing/86, A/New Caledonia/1999, Brisb/07, CA/09, and cH6/1 were purified and used for all the binding experiments described below. In brief, the different HA proteins were expressed through a transient transfection of the EXPI293F cells (Thermo Fisher Scientific) with the different COBRA and H1N1 HA pcDNA3.1/Zeo(+) encoding vectors following the instruction provided by the manufacturer. Alternatively, HA proteins were expressed through the generation of stable transfected cells supplemented with 100 μg/ml of Zeocin (Invivogen). rHA proteins were then purified through the ÄKTA Pure system using HisTrap columns (GE Healthcare) according to the manufacturer’s instructions. The H1N1 A/Texas/36/1991 rHA protein was kindly provided by F. Krammer (Ichan School of Medicine at Mount Sinai, New York, NY). The ELISA was used to assess Ab reactivity against different H1N1 HA strains and performed as previously described (27). In brief, Immulon 4 HBX plates (Thermo Fisher Scientific) were coated overnight at 4°C with 50 μl/well of a solution of carbonate buffer (pH 9.4) containing 1 μg/ml of the different COBRA (P1, X3, or X6), H1N1 (Chile/83, Sing/86, A/Texas/36/1991, NC/99, Brisb/07, and CA/09), or cH6/1 purified rHA and 5 μg/ml of BSA in a humidified chamber. For IgG subclass quantification, ELISA plates were coated in parallel with 2-fold serial dilutions of IgG1, 2a (BioLegend, San Diego, CA) and 2b (Santa Cruz Biotechnology, Dallas, TX) standards starting from 250 ng/ml in carbonate buffer. As a negative control Ag, 5 μg/ml BSA (50 μl/well) were coated alone. Plates were blocked with 200 μl/well of ELISA blocking buffer for at least 1 h at 37°C. Serum samples were 3-fold serially diluted in blocking buffer starting from 1:500 or 1:300 (for whole IgG and IgG subclass detection, respectively) or tested at 1:50 (for IgA detection), and plates were incubated for 1 h at 37°C. Plates were washed five times with PBS, 100 μl/well of goat anti-mouse IgG (Southern Biotech) diluted 1:4000 in blocking buffer added, and plates incubated at 37°C for 1 h. Alternatively, binding to the COBRA P1 Ag was detected through goat anti-mouse IgG1 (1:4000), IgG2a (1:2000), IgG2b (1:500), or IgA (1:2000) purchased from the same manufacturer. Finally, plates were washed five times with PBS, ABTS substrate (VWR International) was added, and plates were incubated at 37°C for 15–20 min. Colorimetric conversion was terminated by addition of 1% SDS (50 μl/well) and OD measured at 414 nm (OD414) using a spectrophotometer (PowerWave XS, BioTek). For IgG, subclass quantification–obtained OD414 values were interpolated through a nonlinear regression analysis with those obtained on IgG1-, IgG2a-, and IgG2b-specific standards. The hemagglutination inhibition (HAI) assay was used to assess functional Abs to the HA able to inhibit hemagglutination of turkey erythrocytes. HAI assay was performed as previously described (9). In detail, to inactivate nonspecific inhibitors, sera were treated with receptor-destroying enzyme (RDE) (Denka Seiken, Japan) prior to being tested. Briefly, three parts of RDE were added to one part of sera and incubated overnight at 37°C. RDE was inactivated by incubation at 56°C for 30 min. RDE-treated sera were diluted in a series of 2-fold serial dilutions in V-bottom microtiter plates (Greiner Bio-One). An equal volume of each H1N1 virus adjusted to ∼8 hemagglutination units/50 μl was added to each well. The plates were covered and incubated at room temperature for 20 min, and then 0.8% of turkey erythrocytes (Lampire Biologicals, Pipersville, PA) in PBS were added. RBCs were stored at 4°C and used within 72 h of preparation. The plates were mixed by agitation and covered, and the RBCs were settled for 30 min at room temperature. The HAI titer was determined by the reciprocal dilution of the last well that contained nonagglutinated RBCs. Positive and negative serum controls were included for each plate. All mice were negative (HAI ≤ 1:10) for preexisting Abs to currently circulating human influenza viruses prior to vaccination and seroprotection was defined as HAI titer >1:40 and seroconversion as a 4-fold increase in titer compared to baseline, as per the World Health Organization and European Committee for Medicinal Products to evaluate influenza vaccines; however, we often examined a more stringent threshold of >1:80. Mice are naive and seronegative at the time of vaccination; thus, seroconversion and seroprotection rates are interchangeable in this study. The focus reduction assay (FRA) was performed as previously described (13). In brief, MDCK-SIAT1 cells were seeded at a density of 2.5–3 × 105 cells/ml the day before the assay was run. The following day, the cell monolayers were rinsed with 0.01 M PBS pH 7.2 (Thermo Fisher Scientific) followed by the addition of 2-fold serially diluted RDE-treated serum at 50 μl/well starting with 1:20 dilution in virus growth medium containing 1 μg/ml TPCK-treated trypsin. Afterwards, 50 μl of virus (Sing/86, Brisb/07, or CA/09) standardized to 1.2 × 104 focus forming units/ml and corresponding to 600 focus forming units/50 μl was added to each well, including control wells. Following a 2-h incubation period at 37°C with 5% CO2, the cells in each well were then overlaid with 100 μl of equal volumes of 1.2% Avicel RC/CL (Type RC581 NF; FMC Health and Nutrition, Philadelphia, PA) in 2× minimum essential medium containing 1 μg/ml TPCK-treated trypsin, 0.1% BSA, and antibiotics. Plates were incubated for 18–22 h at 37°C, 5% CO2. The overlays were then removed from each well and the monolayer was washed once with PBS to remove any residual Avicel. The plates were fixed with ice-cold 4% formalin in PBS for 30 min at 4°C followed by a PBS wash and permeabilization using 0.5% Triton X-100 in PBS/glycine at room temperature for 20 min. Plates were washed three times with PBS/0.1% Tween-20 (PBST) and incubated for 1 h with a mAb against influenza A nucleoprotein (IRR) in ELISA buffer (PBS containing 10% horse serum and 0.1% Tween-80). Following washing three times with PBST, the cells were incubated with goat anti-mouse peroxidase-labeled IgG (SeraCare, Milford, MA) in ELISA buffer for 1 h at room temperature. Plates were washed three times with PBST, and infectious foci (spots) were visualized using TrueBlue Substrate (SeraCare) containing 0.03% H2O2 incubated at room temperature for 10–15 min. The reaction was stopped by washing five times with distilled water. Plates were dried and foci enumerated using a CTL BioSpot Analyzer with ImmunoCapture 6.4.87 software (CTL, Shaker Heights, OH). The FRA titer was reported as the reciprocal of the highest dilution of serum corresponding to 50% foci reduction compared with the virus control minus the cell control. All results are reported as absolute mean values plus SEM. For weight loss comparison among the different mouse groups, data generated to determine weight loss, viral lung titers, plaque size from plaque assays, IgG subclass distribution, and IgG/IgA reactivity against rHA (Figs. 2–5) were compared using the nonparametric one-way ANOVA test. All statistical analysis was performed using GraphPad Prism V.7.00 software (San Diego, CA), and a p value <0.05 was considered statistically significant. Influenza viruses were developed on a 7:1 A/Puerto Rico/8/1934 reassortant backbone to express different H1 HA proteins isolated from either Chile/83, NC/99, or Brisb/07. In addition, a set of viruses were generated to express one of three H1 COBRA HA proteins (P1, X3, or X6) (24). Wild-type Sing/86 and CA/09 influenza viruses were used. BALB/c mice were infected i.n. with a sublethal dose of these H1 reassortant viruses, and their weight was monitored for 14 d. Mice infected with the COBRA X3, X6, Chile/83, and Sing/86 influenza viruses had little or no weight loss compared with the mock-infected mice. Conversely, mice infected with COBRA P1, NC/99, Brisb/07, and CA/09 had a significant weight loss (p < 0.003) that ranged between 5–9% by 3 d postinfection and 18% by 5 d postinfection (Figs. 1, 2A). Each of the H1 COBRA viruses replicated as efficiently as wild-type seasonal H1N1 viruses in mouse lungs but not as well as CA/09 (Fig. 2B). Mice infected with CA/09 had ∼107 PFU/g of lung tissue on day 2 or 3 postinfection, which was three to four logs higher than all seasonal and COBRA-based influenza viruses. Mice infected with COBRA P1 and X6 viruses produced smaller plaques from the lung homogenates than mice infected with any of the other four viruses (Fig. 2C, 2D). No statistically significant difference was observed in plaque size using the same virus derived from the inoculum, day 2, or day 3 lung homogenate samples. Schematic representation of the immunization regimens used in this study. BALB/c mice (n = 5/group) were immunized through an i.n. infection with COBRA or H1N1 viruses described in this study and i.p. or i.m. boosted with the homologous virus. Alternatively, mice (n = 5/group) were primed through an i.p. or i.m. immunization containing COBRA P1 virus and again i.p. or i.m. boosted with the homologous virus. (A) Weight loss curves following intranasal infection of different mouse groups with COBRA, seasonal, or pandemic influenza viruses. Mice were infected at day 0 with COBRA P1 (n = 25), X3 (n = 20), X6 (n = 20), seasonal (Chile/83 [n = 10]; Sing/86 [n = 5]; NC/99 [n = 10]; Brisb/07 [n = 10]), or pandemic (CA/09 [n = 20]) influenza viruses and monitored for weight loss for 14 d. For the control (mock) group (n = 5), 50 μl PBS were i.n. administered. Results are expressed as absolute mean values plus SEM. (B) Viral lung titers in infected mice. BALB/c mice (n = 3 per group per time point) infected on day 0 with 105 PFU of COBRA (P1, X3, and X6), seasonal (Chile/83 and Brisb/07), or pandemic (CA/09) influenza viruses had lungs collected on day 2 and day 3 postinfection. Viral lung titers are listed as PFU per gram of lung tissue and as absolute mean values plus SEM obtained by combining data from two independent experiments. Dotted line represents the limit of detection corresponding to 100 PFU/g. (C) Representative plaque assay wells (original magnification ×1) of MDCK cells infected using samples from day 2 lung homogenates from COBRA–, seasonal–, or pandemic influenza viruses–infected mice and stained with Crystal Violet as described in the Materials and Methods. (D) Area measurement of plaques obtained from plaque assay of COBRA (P1, X3, and X6) and seasonal (Chile/83 and Brisb/07) or pandemic (CA/09) influenza viruses. Showed absolute mean values plus SEM represent the average area obtained from 10 plaques for each virus at day 2 postinfection. ***p < 0.001, **0.001 ≤ p < 0.05. Three weeks postprime (day 21), all mice had low IgG and IgA anti-HA titers (Fig. 3). However, at day 42 (3 wk postboost), all vaccinated mice had anti-IgG HA Abs (Fig. 3A–D) regardless of vaccine regimen, but there was little increase in anti-HA IgA Abs (Fig. 3E–H). Mice infected with the COBRA P1 virus i.n. and boosted i.p. elicited anti-HA Abs (primarily of the IgG1 subclass) that bound to all the seasonal influenza HA proteins with the highest titer compared with the same P1 HA Ags administered the other three routes of inoculation (data not shown). Mice vaccinated with different vaccine regimens were assessed for the elicitation of different anti-HA IgG subclasses (Fig. 4). Mice infected i.n. and boosted i.p. had the highest IgG1, IgG2a, and IgG2b anti-HA Ab titers compared with mice vaccinated by any of the other regimens. Mice vaccinated twice by the i.p. route had statistically similar IgG1 titers as mice vaccinated i.n. + i.p. In contrast, mice infected by i.n. and boosted by i.m. had statistically similar IgG2b titers as mice vaccinated i.n. + i.p. Mice vaccinated twice i.m. had the lowest anti-HA titers for all subclasses (Fig. 4). Serum IgG (A–D) and IgA (E–H) titer from BALB/c mice (n = 5/group) at day 0 or following COBRA P1 virus i.n., i.p., or i.m. prime at day 21 or following the i.p. or i.m. boost at day 42 against the homologous COBRA P1 rHA Ag. For IgG titer, sera were tested at 1:500, whereas for IgA at 1:50. Shown results are expressed as absolute mean values plus SEM obtained in a single experiment and using the different mouse group sera. Data are representative of two independent experiments evaluating serum IgG and IgA reactivity of the same mouse groups against the COBRA P1 rHA Ag. For each independent experiment, mouse sera were run in duplicate. ***p < 0.001, *p ≤ 0.05. Serum IgG subclass representation from BALB/c mice (n = 5/group) following COBRA P1 virus i.n., i.p., or i.m. prime followed by i.p. or i.m. boost. Titer was determined using day 35–59 pooled postboost sera and reported as absolute mean value plus SEM obtained in a single experiment and using sera from different mouse groups. Data are representative of two independent experiments evaluating the serum IgG subclass distribution of the same mouse groups against the COBRA P1 rHA Ag. For each independent experiment, mouse sera were assayed in duplicate. Micrograms of IgG1, IgG2a, and IgG2b standards per milliliter (micrograms per milliliter) equivalents were determined by interpolating the O.D.414 values obtained from the serum samples with those obtained from the corresponding IgG1, IgG2a and IgG2b standards. ***p < 0.001, **0.001 ≤ p < 0.05. Antisera collected from mice immunized via i.n. + i.p. with COBRA and wild-type HA influenza viruses were tested against a panel of H1N1 rHA. Antisera collected from these mice detected all the tested rHA proteins (Figs. 5, 6, Supplemental Fig. 1). This overall cross-reactivity could be predominantly attributed to the presence of stem-directed Abs, as evidenced by observing the reactivity against the cH6/1 rHA protein. However, collectively, sera from COBRA P1–, X3–, and X6–immunized mice showed a high-titer broad reactivity against the multiple H1N1 rHA tested, suggesting the elicitation of more cross-reactive Abs by the COBRA immunogens compared with the H1N1 vaccine strains. Breadth of Ab response using different immunization regimens. Serum IgG titer from BALB/c mice (n = 5/group) following COBRA P1 virus i.n., i.p., or i.m. prime followed by i.p. or i.m. boost on homologous (COBRA P1), seasonal (Sing/86 and Brisb/07), or pandemic (CA/09) rHA proteins. IgG titer was determined using day 35–59 pooled postboost sera and is reported as area under curve (AUC) of the obtained OD414 values from 3-fold serial diluted sera plus SEM obtained in a single experiment and using the different mouse group sera. Data are representative of three independent experiments evaluating the serum IgG titer of the same mouse groups against the COBRA, seasonal, and pandemic rHA Ags. For each independent experiment, mouse sera were assayed in duplicate. ***p < 0.001, **0.001 ≤ p < 0.05. Breadth of binding and HAI activity of serum Ab from i.n. + i.p. vaccinated groups (COBRA: P1 [n = 15], X3 [n = 15], X6 [n = 15]; seasonal: Chile/83 [n = 10], Sing/86 [n = 5], NC/99 [n = 10], and Brisb/07 [n = 10], and pandemic H1N1: CA/09 [n = 6]), using COBRA, seasonal, or pandemic H1N1 viral strains. White dots indicate the IgG binding titer against COBRA (P1, X3, and X6) and multiple H1N1 rHA expressed as area under curve (AUC) of the obtained OD414 values from 3-fold serial diluted sera on the different rHA proteins. The y-axes on the right of each graph are expressed as antilog of Log10. The continuous black lines indicate the AUC values obtained on cH6/1 rHA protein and approximately representing the contribution of stem-binding Abs. Black bars indicate the HAI titers (left y-axis) against COBRA (P1, X3, and X6) and multiple H1N1 viruses (x-axis). Titers below the limit of detection were assigned a value of 5 for the purpose of calculating the geometric mean titer and are not visible on this scale. The y-axes along the left of each graph are expressed as Log2. Values are reported as absolute mean values plus SEM obtained in a single experiment and using sera from different mouse groups (A–H). Data are representative of three independent experiments evaluating the breadth of binding and HAI activity of sera from the same mouse groups. For each independent experiment, mouse sera were assayed in duplicate. Black dotted lines delimiting the gray area indicate the 1:40–1:80 HAI titer range. To determine the ability of these vaccines to elicit high-titer receptor blocking Abs, antisera collected from mice vaccinated i.n. + i.p. with each vaccine were assessed for HAI activity (Fig. 6). Mice had high HAI titers against each specific homologous virus. However, mice vaccinated with COBRA viruses elicited Abs with HAI activity against more wild-type H1N1 viruses in the panel than antisera from mice vaccinated with a wild-type virus. For example, mice vaccinated with the COBRA P1 virus had antisera with a protective HAI titer against two of the five historical seasonal H1N1 influenza viruses but also against three of the postpandemic strains (Fig. 6A, black bars). However, even when COBRA P1–infected mice had little or no HAI activity against a specific strain in the panel, the virus still elicited cross-reactive anti-HA Abs (Fig. 6A, white dots). In contrast, mice vaccinated with one of the four seasonal H1 viruses had antisera that recognized two to three of the seasonal strains and none of the postpandemic strains (Fig. 6D–G), which was similar to the antisera elicited by the COBRA X3 and X6 viruses (Fig. 6B, 6C). The mice vaccinated with the CA/09 virus elicited Abs that only recognized the postpandemic strains (Fig. 6H). In general, COBRA X3, X6, and the seasonal viruses elicited anti-HA IgG Abs that bound to the seasonal rHA proteins (Fig. 6B–G, white dot), and the antisera elicited by CA/09 infections recognized only the postpandemic HA proteins (Fig. 6H, white dot). To determine the ability of the vaccine-elicited Abs to neutralize viral infection, an FRA was performed (Fig. 7). The Sing/86 virus was efficiently neutralized with antisera from mice vaccinated with the homologous, the Chile/83, and the COBRA X3 viruses (Fig. 7A, Table I). Similarly, COBRA P1 and X6 neutralized the Sing/86 virus with a 50% neutralization log2 serum dilution titer of 5.5. The Brisb/07 virus was neutralized with antisera from mice vaccinated with the COBRA X6 virus with a 50% neutralization of virus at a log2 serum dilution of 9.5 (Fig. 7B, Table I). Antisera from mice vaccinated with NC/99 and the homologous virus also efficiently neutralized (log2 titer of 7.3) the Brisb/07 virus. No antisera from any of the other viruses neutralized the Brisb/07 virus. In contrast, only antisera from mice vaccinated with CA/09 and COBRA P1 viruses neutralized the CA/09 virus (Fig. 7C, Table I), with a 50% neutralization log2 serum dilution titer of 12.2 and 8.0, respectively. Neutralizing activity of serum Abs from i.n. + i.p. vaccinated groups (COBRA: P1 [n = 15], X3 [n = 15], X6 [n = 15]; seasonal: Chile/83 [n = 10], Sing/86 [n = 5], NC/99 [n = 10], Brisb/07 [n = 10]; pandemic H1N1: CA/09 [n = 6] and mock [n = 5]) against seasonal and pandemic H1N1 viral strains. FRA was performed against Sing/86 (A), Brisb/07 (B), and CA/09 (C) viruses using sera from mouse groups i.n. + i.p. vaccinated with COBRA, seasonal, or pandemic H1N1 viral strains. Data were obtained from a single experiment and are reported as absolute mean values plus SEM of the different mouse group sera. Data are representative of two independent experiments evaluating the neutralizing activity of sera from the same mouse groups. For each independent experiment, mouse sera were assayed in duplicate. The U.S. National Institute of Allergy and Infectious Diseases has identified the development of broadly protective or universal influenza vaccines as a top priority (29). This next generation of influenza vaccines should elicit long-lasting protective immune responses against multiple strains and multiple subtypes (29). Recently, our group has described the development of different COBRA HA candidates able to provide broader protective Abs against multiple H1N1, H5N1, and H3N2 influenza viral strains. In detail, COBRA HA immunogens expressed on the surface of a VLP vaccine elicited a subtype-specific cross-protective immune response against divergent influenza strains (9, 11–13). Although VLP-based immunogens are effective and licensed as a vaccine platform for other human pathogens, such as the human papillomavirus (30), their use as a single-shot influenza vaccine are unlikely to be an effective vaccine strategy for people because of production costs and vaccine efficiency. To address these issues, COBRA HA proteins were expressed on the surface of an influenza virus and used in an intranasal prime and i.p. boost strategy to elicit high-titer Abs in mice. LAIV vaccines have been licensed for human use since 2003 (31). As a first goal, an effective immunization regimen was established in mice that were immunologically naive to influenza viruses, which resulted in a prime-boost strategy using the same virus in each vaccination. Mice i.n. primed had superior serum HAI titers following a parental boost compared with mice vaccinated with the same virus primed i.p. or i.m. This difference could primarily be attributed to the intranasal infection, which triggers innate immunity responses and is necessary for the development of an effective adaptive immune response. In fact, intranasal priming, such as in the case of LAIV, results in intracellular Ag expression and enhanced cellular immune responses (32). Moreover, LAIV vaccines deliver a whole set of influenza viral Ags (HA, NA, M2, M1, and NP) to the host immune system. For these reasons, LAIV vaccines induce adaptive immune responses with greater quality, titer, and longevity in people compared with IIV (10, 32, 33). LAIV vaccines provide stronger IgA-mediated mucosal immunity (34, 35) and stimulate T cell responses as well as trigger a broad innate immune response, which all contribute to the overall protection against influenza virus infection (36–38). Therefore, using a virus to deliver COBRA HA proteins to the nasal and respiratory mucosa could be an effective strategy alone, or in a prime-boost regimen, for the development of future LAIV vaccines. Currently, LAIV are not globally licensed, and during the 2015–2016 influenza season, the U.S. Centers for Disease Control and Prevention did not recommend the use of LAIV for vaccination. The vaccine effectiveness of LAIV appeared to significantly decrease between 2013 and 2016 (39). Following improvements in the vaccine to address these effectiveness issues, LAIV was again recommended for vaccine use for the 2018–2019 influenza season in healthy, nonpregnant people between 2 and 49 y of age (40). These COBRA HA–based viruses do not replicate as efficiently as viruses with wild-type HA proteins. In fact, COBRA HA viruses had similar lung viral titers as seasonal influenza viruses but three to four logs lower than CA/09 virus, and the plaque sizes were considerably smaller than seasonal influenza viruses but similar to the size of CA/09 viruses (Fig. 2). Because most of the used viruses (with the exception of Sing/86 and CA/09) were generated as 7:1 PR8 reassortant viruses, with the HA being the only variable gene segment, the viral replication efficiency most likely is associated to the ability of HA to bind to specific glycans or mediate fusion and entry of the virus into cells. Although it is unclear what the significance of these replication observations mean, lower rates of viral replication may represent an advantage for the development of a LAIV-based COBRA vaccines without the need for host adaptations and enhanced safety for human use. The isotype of Ab was influenced by the vaccination regimen. Because the virus used as immunogen was the same, the specific route of inoculation as well as the adjuvant used appear to have influenced the IgA and IgG isotype profiles. In particular, mice primed with any of the four vaccine regimens elicited significantly higher IgA Ab titers following boost (Fig. 3). However, mice immunized through an intranasal infection followed by an i.p. boost (i.n. + i.p.) had a larger IgG subclass distribution (Fig. 4) and breadth of anti-HA IgG binding against different H1N1 rHA proteins (Fig. 5) compared with any of the other vaccine regimens. Broadly reactive Ab responses are associated with a diverse IgG subclass of profiles (41, 42). IgG1 Abs mediate complement fixation, opsonization, and induction of Ab-dependent cell-mediated cytotoxicity by NK cells. All i.p. boosted mice had high-IgG1 titers. Additionally, all mice i.n. primed and i.p. boosted had statistically higher IgG2a Ab titers compared with mice vaccinated with the same vaccines in any other regimen. The IgG2a isotype has the highest affinity for the activating FcγR in mice, and the induction of anti-HA stem IgG2a Abs have been associated with higher viral neutralization titers (43, 44). These Fc-FcγR–mediated functional assays can measure non-HAI–induced protection; however, there are differences between mice and humans. In humans, Fc-mediated effector functions are predominately via IgG1 Abs, whereas in mice these functions are mediated through IgG2a Abs (45). Therefore, vaccine regimens that elicit predominately IgG2a isotype profiles in mice and enhance Fc-mediated functions may not be translated into vaccine studies in people. Conversely, the protective effect of HAI-specific Abs is independent from IgG subclass (43); and thus, eliciting different IgG subclasses could confer protection against influenza by partly overlapping mechanisms. The second goal of this study was to further characterize the biological activity of the elicited Ab response following the i.n. + i.p. immunization using COBRA HA Ags. 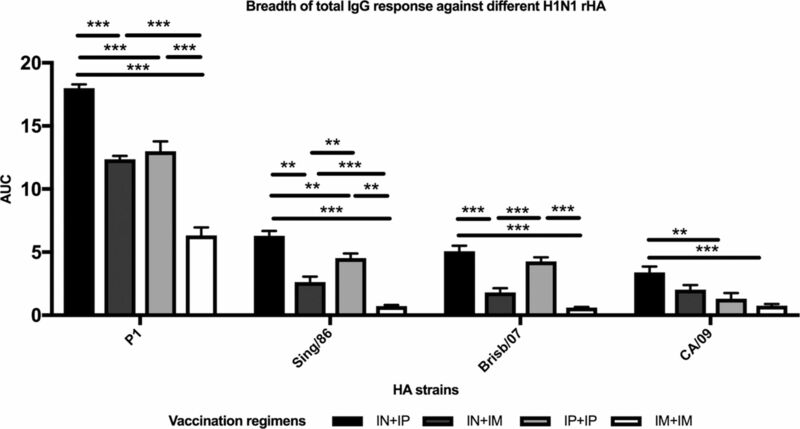 As previously described (9, 24), vaccines with COBRA H1 HA Ags elicit a broader HAI and neutralization activity against historical and contemporary influenza viruses compared with wild-type HA proteins (Figs. 6, 7, Table I). The P1 COBRA vaccine elicited Abs with HAI activity against contemporary strains (A/Michigan/45/2015) that were isolated after the time period of the input viruses used in the design of the P1 HA Ag. In fact, COBRA P1 was designed using HA sequences from human viruses isolated from 1933 to 1957 and 2009 to 2011 as well as swine sequences isolated from 1931 to 1998 (9). In addition, as previously reported by other colleagues (46) and by our group (24, 47), the cH6/1 recombinant protein was used as screening Ag to assess the binding contribution of stem-directed Abs. In this regard, as already described (24), the binding activity of sera from COBRA virus–immunized animals on the chimeric cH6/1 protein suggests that COBRA can elicit Abs able to recognize conserved HA regions such as those encompassing the HA2 segment (Fig. 6). Interestingly, the COBRA X6 virus vaccine–elicited Abs outperformed the neutralizing activity of Brisb/07 virus vaccine–elicited Abs against the homologous virus, although both vaccines elicited similar HAI titers. COBRA X6 HA may thus elicit Abs to additional epitopes on the head and stem of HA that the wild-type Brisb/07 virus does not elicit, but future studies are necessary using mAbs to map these epitopes. 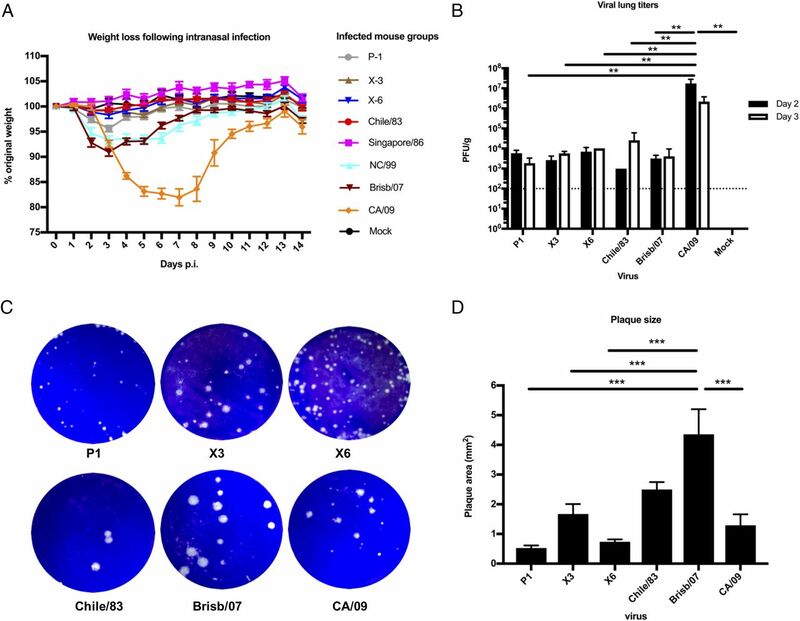 In contrast, CA/09 HA–induced Abs that outperformed COBRA P1 HA–induced Abs at neutralizing CA/09 virus (Fig. 7C, Table I), but these same COBRA P1 HA–induced Abs outperformed CA/09 HA–induced Abs by neutralizing the seasonal Sing/86 virus (Fig. 6A). Alternatively, COBRA HA proteins may elicit high-affinity Abs compared with the Abs elicited by wild-type HA Ags from other vaccine strains and shape the Ab response against a broader set of conserved protective HA head epitopes. The COBRA algorithms result in an immunogen that maintains both the HA head and stalk epitopes that induces subtype-specific, cross-reactive Ab responses (8, 9, 11–13, 15). Future studies will need to evaluate these live virus COBRA HA–based vaccines in preimmune models. Because almost all humans are preimmune to various subtypes of seasonal influenza viruses, testing novel influenza vaccines regimens in naive animal hosts may not reflect how these vaccines would work in people. COBRA HA vaccines are even more effective in influenza-primed ferrets (24). However, a vaccine prime and boost is necessary to elicit high-titer Abs in immunologically naive hosts (Fig. 3). Future clinical trials with candidate COBRA-based vaccines may confirm vaccine effectiveness in people. Also, additional studies to thoroughly understand the immunological mechanisms elicited by COBRA HA Ags are needed to dissect the Ab responses. Understanding these mechanism(s) that COBRA HA proteins use to elicit broadly reactive Abs is important for the design and improvement of broadly reactive Ags as well as identifying the combination of epitopes important for eliciting breadth of Ab neutralization against diverse influenza viruses (24). We thank Emily Clutter for technical assistance and Rodrigo Abreu for helpful discussions. Many of the reassortant viruses were provided by Virapur (San Diego, CA), and the mouse mAb to recombinant NP from influenza A/Brisbane/10/2007 (H3N2), clone AT251.455.177, FR-667 was obtained through the Influenza Reagent Resource, Influenza Division, Center for Disease Control and Prevention, Atlanta, GA. This work was supported by the University of Georgia, M-001.
. 2003. Influenza. Lancet 362: 1733–1745. 2004. Influenza: old and new threats. Nat. Med. 10(12, Suppl. ): S82–S87.
. 2015. Advances in the development of influenza virus vaccines. [Published erratum appears in 2015 Nat. Rev. Drug Discov. 14: 294.] Nat. Rev. Drug Discov. 14: 167–182.
. 2012. Neutralization activity and kinetics of two broad-range human monoclonal IgG1 derived from recombinant Fab fragments and directed against Hepatitis C virus E2 glycoprotein. New Microbiol. 35: 475–479.
. 2014. A model-based economic analysis of pre-pandemic influenza vaccination cost-effectiveness. BMC Infect. Dis. 14: 266.
. 2018. Towards a universal influenza vaccine: different approaches for one goal. Virol. J. 15: 17.
. 2012. Computationally optimized antigens to overcome influenza viral diversity. Expert Rev. Vaccines 11: 267–269.
. 2016. Design and characterization of a computationally optimized broadly reactive Hemagglutinin vaccine for H1N1 influenza viruses. J. Virol. 90: 4720–4734.
. 2015. Cross-protection against H7N9 influenza strains using a live-attenuated H7N3 virus vaccine. Vaccine 33: 108–116.
. 2012. A computationally optimized hemagglutinin virus-like particle vaccine elicits broadly reactive antibodies that protect nonhuman primates from H5N1 infection. J. Infect. Dis. 205: 1562–1570.
. 2011. A computationally optimized broadly reactive antigen (COBRA) based H5N1 VLP vaccine elicits broadly reactive antibodies in mice and ferrets. Vaccine 29: 3043–3054.
. 2017. Computationally optimized broadly reactive Hemagglutinin elicits Hemagglutination inhibition antibodies against a panel of H3N2 influenza virus cocirculating variants. J. Virol. 91: e01581-17.
. 2017. Broadened immunity and protective responses with emulsion-adjuvanted H5 COBRA-VLP vaccines. Vaccine 35: 5209–5216.
. 2015. Cocktail of H5N1 COBRA HA vaccines elicit protective antibodies against H5N1 viruses from multiple clades. Hum. Vaccin. Immunother. 11: 572–583.
. 2018. Interim estimates of 2017-18 seasonal influenza vaccine effectiveness - United States, February 2018. MMWR Morb. Mortal. Wkly. Rep. 67: 180–185.
. 2018. Vaccines for preventing influenza in healthy adults. Cochrane Database Syst. Rev. 2: CD001269.
. 2012. Efficacy and effectiveness of influenza vaccines: a systematic review and meta-analysis. Lancet Infect. Dis. 12: 36–44.
. 2008. Correlation of cellular immune responses with protection against culture-confirmed influenza virus in young children. Clin. Vaccine Immunol. 15: 1042–1053.
. 2016. Live attenuated influenza vaccine in children induces B-cell responses in tonsils. J. Infect. Dis. 214: 722–731.
. 2011. The relative efficacy of trivalent live attenuated and inactivated influenza vaccines in children and adults. Influenza Other Respir. Viruses 5: 67–75.
. 2009. Efficacy of live attenuated influenza vaccine in children: a meta-analysis of nine randomized clinical trials. Vaccine 27: 1101–1110.
. 2018. Vaccines for preventing influenza in healthy children. Cochrane Database Syst. Rev. 2: CD004879.
. 2000. C3d enhancement of antibodies to hemagglutinin accelerates protection against influenza virus challenge. Nat. Immunol. 1: 127–131.
. 2015. Broadly neutralizing anti-influenza virus antibodies: enhancement of neutralizing potency in polyclonal mixtures and IgA backbones. J. Virol. 89: 3610–3618.
. 2017. Infection of ferrets with influenza virus elicits a light chain-biased antibody response against Hemagglutinin. J. Immunol. 199: 3798–3807.
. 2014. Flow cytometry reveals that H5N1 vaccination elicits cross-reactive stem-directed antibodies from multiple Ig heavy-chain lineages. J. Virol. 88: 4047–4057.
. 2018. A universal influenza vaccine: the strategic plan for the National institute of allergy and infectious diseases. J. Infect. Dis. 218: 347–354.
. 2018. Opportunities and challenges for human papillomavirus vaccination in cancer. Nat. Rev. Cancer 18: 240–254.
. 2018. Urgent challenges in implementing live attenuated influenza vaccine. Lancet Infect. Dis. 18: e25–e32.
. 2018. Pan-influenza a protection by prime-boost vaccination with cold-adapted live-attenuated influenza vaccine in a mouse model. Front. Immunol. 9: 116.
. 1999. Mucosal immune response to trivalent live attenuated intranasal influenza vaccine in children. Vaccine 18: 82–88.
. 1990. Functional role of respiratory tract haemagglutinin-specific IgA antibodies in protection against influenza. Vaccine 8: 479–485.
. 2007. Live attenuated versus inactivated influenza vaccine in infants and young children. [Published erratum appears in 2007 N. Engl. J. Med. 356: 1283.] N. Engl. J. Med. 356: 685–696.
. 2007. Immediate and broad-spectrum protection against heterologous and heterotypic lethal challenge in mice by live influenza vaccine. Vaccine 25: 8067–8076.
. 2013. Cross-protective immune responses elicited by live attenuated influenza vaccines. Yonsei Med. J. 54: 271–282.
. 2017. Live-attenuated influenza vaccine effectiveness in children from 2009 to 2015-2016: a systematic review and meta-analysis. Open Forum Infect. Dis. 4: ofx111.
. 2018. Update: ACIP recommendations for the use of quadrivalent live attenuated influenza vaccine (LAIV4) - United States, 2018-19 influenza season. MMWR Morb. Mortal. Wkly. Rep. 67: 643–645.
. 2010. Intranasal immunization with influenza VLPs incorporating membrane-anchored flagellin induces strong heterosubtypic protection. PLoS One 5: e13972.
. 2014. IgG subclasses and allotypes: from structure to effector functions. Front. Immunol. 5: 520.
. 2012. Universal vaccine against influenza virus: linking TLR signaling to anti-viral protection. Eur. J. Immunol. 42: 863–869.
. 2016. Influence of immunoglobulin isotype on therapeutic antibody function. Blood 127: 1097–1101.
. 2012. Hemagglutinin stalk-reactive antibodies are boosted following sequential infection with seasonal and pandemic H1N1 influenza virus in mice. J. Virol. 86: 10302–10307.
. 2015. Sequential infection in ferrets with antigenically distinct seasonal H1N1 influenza viruses boosts Hemagglutinin stalk-specific antibodies. J. Virol. 90: 1116–1128.